We’ve all come across a situation where we needed some sort of help with WordPress, be it how to use the dashboard as a beginner, or how to achieve something with a particular plugin or theme. Frequently we’re advised to read a page from some documentation or watch a video tutorial, which, while possibly being adequate support, don’t offer the personal, one-on-one feel that a walkthrough from another individual would give. As is self-described, Sidekick is the fastest and easiest way to learn WordPress. It’s a way of providing interactive tutorials right within your dashboard that will not only reduce support costs but also increase customer success. It provides support for a number of platforms including cPanel and Google Apps. Simply put, you’ll have an extra level of support right at your fingertips. In direct relation to this point, another great advantage is that your support requests will reduce. Rather than having to contact support for simple requests such as how to set up the general settings for your plugin, you will have a personal guide to walk them through it. In addition to this, the so-called personal guide provides three learning methods in one; visual, text-based as well as verbal. This combination is what makes Sidekick the powerful tool that it is. Another point worth mentioning is that Sidekick still allows for other multi-media, such as videos and photos, to be included with the walkthrough, ensuring that the user never has to leave his or her dashboard to find any other related media. With KLEO 4.0 you’ll get a FREE PREMIUM Sidekick yearly license, 10 KLEO specific tutorials and more than 200 WordPress basic walkthroughs. 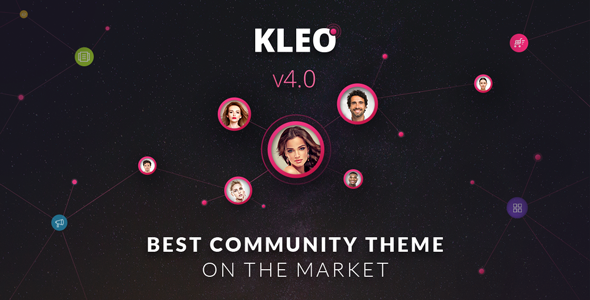 Version 4.0 of KLEO theme features three new demos: company, food/restaurant and register landing page. While first two demos need no explanations, we would like to underline few things about the third one. There are many rules and principles of great design but when it comes to a website’s landing page; it is almost an exact science. It’s about ‘conversion-centered design’, or using the design of the landing page to persuade a user towards a particular action. Arguably most important task is to find a clear USP (unique selling point) for the product or service in question, and then use the landing page design to focus everything on one primary call to action (CTA). This might be getting the visitor to register their details, say, or make a purchase there and then. Whatever your goal, it’s up to the distinct KLEO design to channel the user towards it – whether through use of white space, contrasting colors or more explicit directional cues and registration. With this new addition, KLEO can cover more than 21 categories, from e-commerce to e-learning and from simple one-page presentation to complex, boxed magazine layout. KLEO covers twenty one categories and counting. We take “multipurpose” very seriously. If you want to have your KLEO set up exactly as it appears in the demo, you can import the content we use for the demos onto your site. Doing this allows you to get a really good feel for the theme. You can import demo content via WordPress, following a 8-steps process. But a less time-consuming way is to use our demo content importer. Designed to give you an instant access to KLEO’s design and features, demo content importer is intuitive and fast. It also contains Revslider import integration for every page.